In the past 24 hours, Russia-backed militants 29 times attacked Ukrainian army positions in eastern Ukraine. 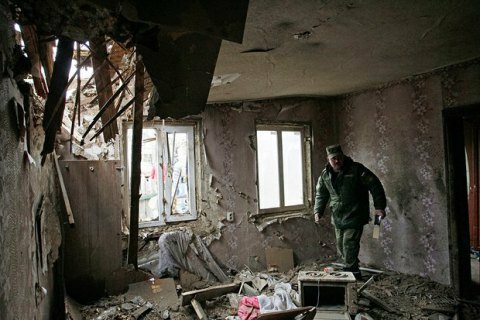 ATO forces saw four attacks near the town of Avdiyivka, and once in the village of Zaitseve. From 19:00 to midnight the militants launched 135 mines from banned 82mm mortars, toward the industrial zone of Avdiyivka. The militants fired from 152mm cannon artillery twice near Pravdivka. Civilian houses and the local church were reported destroyed by enemy fire. The militants violated the ceasefire near Luhanske, using weapons of armoured fighting vehicles, automatic grenade launchers and heavy machine guns. They also fired rocket-propelled grenades and small arms on the Ukrainian military near the villages of Novotroyitske, Pavlopil, Stanytsia Luhanska and Shyrokyne, as well as 12 times toward the town of Maryinka. The Ukrainian troops had to return fire of four occasions, the press center said.